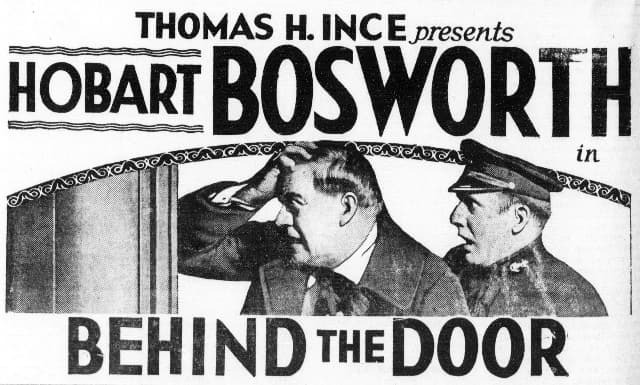 Behind the Door is a surviving 1919 silent war drama film produced by Thomas Ince, directed by Irvin Willat and distributed by Paramount Pictures. The picture is a starring vehicle for veteran actor Hobart Bosworth. The film’s source is a short story by Gouverneur Morris, “Behind the Door”. The film is extant at the Library of Congress and the Gosfilmofond Russian State Archive. The supporting cast features Jane Novak and Wallace Beery. As described in a film magazine, Oscar Krug (Bosworth) is looked upon with suspicion by his neighbors because of his name. When the United States is drawn into the war with Germany, a group of citizens attack Krug. They are met with strong opposition from Krug and decide to leave him alone. Bill Tavish, his greatest opponent, becomes his closest friend and they travel the seas together as captain and first mate. Krug marries Alice Morse against her family wishes, and, when the family finds out, she is driven from the home, so she stows away on her husband’s ship. A submarine sinks the ship and Alice is snatched from Krug’s side by a German officer. Krug now lives to revenge himself on the captain of the German submarine, and when the opportunity presents itself, he wreaks a terrible vengeance upon him.